The Zeltbahn was a multi-purpose piece of equipment that was issued to every soldier at the beginning of his basic training. 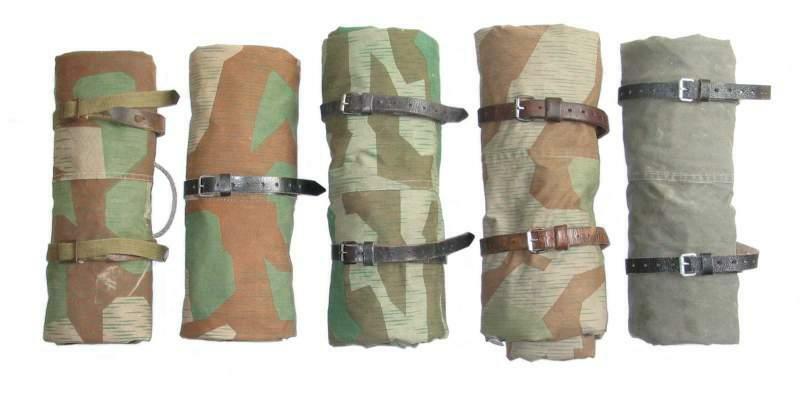 This simple but ingenious item could be combined to make tents or shelters of various sizes, for all sorts of camouflage and as a rain cape, an improvised floatation device or an emergency stretcher. The Zeltbahn 31 was developed in 1931 and found its origin in the square Reichswehr tent. pattern which is also known as Army Splinter Pattern (Heeres Splitter Muster 31). Another phrase used was: Buntfarbenaufdruck. As can be seen on the right of the picture below, completely field grey examples existed. These are mostly early war shelter quarter given to other organisations then the military. Also noticable is the variety of shades encountered. but the shelter quarter could be used for a variety of purposes.